There is a lot of water in the Alhambra which leads to a lot of interesting reflections. 6,000 people a day visit the Alhambra. It is Spain’s most visited monument. It was originally constructed as a small fortress in 889. The Alhambra eventually became the residence of royalty and of the court of Granada in the middle of the thirteenth century. 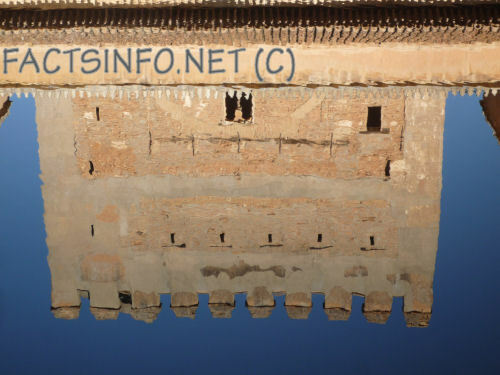 The first change from a fort to a palace happened around 1333, by the Sultan of Granada, Yusuf I. The Alhambra was meant to be a paradise on earth. The main buildings of the Alhambra complex are built on a plateau which measures about 740 meters (2430 ft.) in length and 205 meters (674 ft.) at its greatest width. A visit to the Alhambra normally takes about 2 or 3 hours and most people walk around 3 or 4 kilometers on the way. There are places to buy food and drink inside the Alhambra but most people bring a sandwich or use the small bars or kiosks. In the last 20 years or it has been very difficult to buy tickets for the Alhambra. The problem is created by the very high demand and the restriction in the amount of people allowed into the Nazrid palaces. Some years ago there was a problem with corruption, so afterwards the ticket distribution system was outsourced to ticketmaster. This was very unsuccessful, it is hard to believe how a big name in tickets could do such a bad job. Many people had to put up with a very inefficient, badly run service. Australian very not allowed to use credit cards which caused a lot of consternation. At the time of writing the ticket system is not too bad but buying tickets still requires your full attention. When people go to visit most cities they first book a flight and accommodation then think about where to visit. In Granada people first book their Alhambra tickets then find a flight and hotel. Granada is not far from a fault line and small Earthquakes are fairly common. In 1821 an earthquake caused damage to the Alhambra complex. Every century or so there are bigger earthquakes on April 19 1956 in the town of Albolote, just outside the city, an earthquake reaching 5.1 on the Richter scale killed 12 people and destroyed 250 homes so the Alhambra has experienced many fairly large quakes in its history. The Lisbon Earthquake of 1755 which killed 60 thousand people would have been felt here. 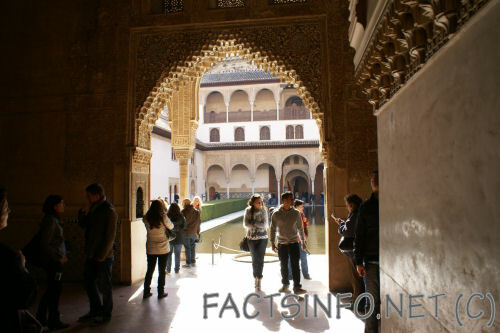 The amount of people allowed in the Nasrid palaces at any one time is restricted so it is necessary to buy a ticket which states the time that the person can enter into this part of the Alhambra. The Nasrid dynasty was the last Arab Muslim dynasty in Iberia, ruling the Emirate of Granada from 1230 until 1492. Twenty-three emirs ruled Granada from the founding of the dynasty in 1230 by Muhammad I until January 2, 1492, when Muhammad XII (Boabdil) surrendered to the Christian Spanish kingdoms of Aragon and Castile. Today, the most visible evidence of the Nasrids is the Alhambra palace complex built under their rule. The loss of Granada marked the end of seven centuries of Muslim rule in southern Spain. Boabdil was the last Arabic ruler who lived in the Alhambra. He negotiated the take over of the Alhambra by the Spanish monarchs. He left by the back door, (la puerta de los siete suelos), he asked that the door be shut forever afterwards. You can see this door on your left soon after entering the Alhambra from the ticket office. The geometric artwork decorating the interiors of the Alhambra follow Islamic law, meaning there are no depictions of living beings. 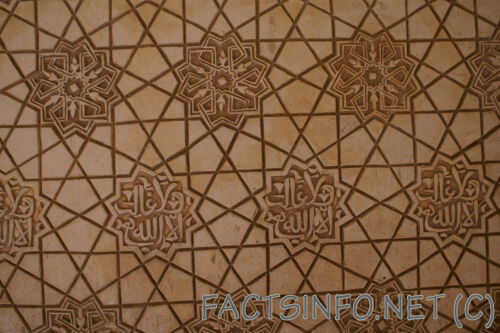 The ceilings, columns and walls of the Alhambra are covered with over 10,000 Arabic inscriptions. They contain everything from snatches of poetry and verses from the Qur’an to clever aphorisms, boastful slogans and pious wishes. The Nasrid motto – “There is no victor but Allah” – is the most common inscription. The illustrator M.C. Escher visited the palace twice. The patterns, tessellations and rotational symmetry had a big influence on his drawings.